As an active member of SBCA, the greatest value I receive is through the relationships I’ve formed at Open Quarterly Meetings (OQMs) over the last few years. 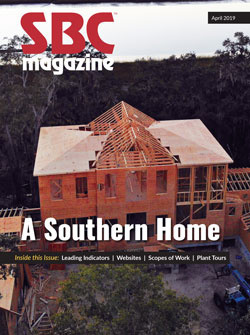 Sure, SBCA does a lot of great things with the magazine and the services and products they offer, but the ability to pick up the phone and call a fellow component manufacturer (CM) from somewhere outside of my shipping area is the most powerful tool SBCA has put in my toolbox. What’s the best way for you (and me) to get greater value from SBCA? Attend an OQM and start making relationships! I’m not talking about sending one of your managers, although they would be welcomed and I’m sure everyone would benefit. I want to see more owners and young people at OQMs, so we can all benefit from trading knowledge and experience while exposing the next generation to new ideas and best practices in the industry. As the owner of my company, I have a unique perspective on my business and how we manufacture trusses. I want (and need) to be able to trade views and opinions with other owners to improve my business, and in the process, likely improve your business, too. You may think you’re too small and won’t benefit but I argue the smallest manufacturers have the most to gain and can even provide the most innovative solutions to the problems we all face. I understand attending multiple meetings a year can be difficult but if you want to maximize your SBCA Membership ROI, pick one OQM close to home (they are typically spread across the country each year) and attend BCMC. You will see your ROI on membership sky rocket as a result and you will return to your plant excited and invigorated to build trusses! Our industry needs to engage more young people, specifically millennials. They are obviously the future but we have so much to learn from them. They are much more efficient, know technology better than most of us Gen Xers and Baby Boomers, and pretty soon, they’re going to be running the show. What better training program can we offer a promising young employee than to bring them to an OQM, surround them with the industry’s best and brightest, and engage them with the Emerging Leaders Committee to show them examples of their peers succeeding in the industry? I have been in more truss plants in the last three years I’ve been active with SBCA than the 20 years prior. I learn something from every truss plant I visit. After all, there aren’t many secrets in this industry and it’s just a matter of getting out and seeing what ideas or methods will work for you. Each time I look to purchase a piece of equipment, I pick up the phone and call someone I know who is using the same piece of equipment. I visit their operation and see how it operates in a similar environment to which I plan to employ it. What better way to know if your purchase will be successful than to see it running in an existing operation? A specific example of a relationship that helped me recently occurred at the recent San Diego OQM (see page 48). Upon landing at the airport, I turned on my phone and scrolled through my emails. One was a letter from the IRS indicated they were going to audit my company based on a new trailer purchase we made in 2017. Obviously I was sweating bullets and was worried about paying my accountant $365 an hour to gather countless documents from the last seven years. I brought the letter up at dinner that night and the person sitting across the table from me had the same exact experience a couple years ago on the same exact purchase! After talking for a few minutes I had a clear strategy to appease the IRS and limit their investigation to exactly what triggered their inquiry. I have no idea how much I would have spent working through an IRS audit, nor how much stress I would have endured had I not brought up my issue at the OQM! Hopefully I’ve persuaded you to attend an OQM over the next several months. I promise you’ll take something away that will improve our operations. You owe it to yourself to engage with SBCA meetings but you also owe it to the industry and the next generation of CMs to offer your knowledge and experience. I look forward to seeing you at an OQM soon!